Our weekly Did You Know series focuses on providing users with informative, “how-to” tips to help them get the most out of PTC Creo. This week’s post is based off an intermediate level tutorial which answers the question: “How do I create a helical pattern of a spherical cut on the side of a cylinder?” After reading this post, users we be able to complete this task in 3 steps. The secret to making the helical pattern is in how the sketch plane is set up for the feature that you want to pattern. The dimensioning scheme for the sketch plane must support the pattern that you want to create. We will pattern a spherical cut which we will create with a Revolve feature. To begin, select Revolve and invoke the datum tool to create a datum plane on the fly. Create the plane through the center axis of the cylinder and at an angle to one of the datum planes. The angular dimension will be used by the pattern as a dimension to increment when making subsequent instances, so the value here isn’t important, except for the placement of the first pattern instance. Accept the default value of 45 degrees. Resume the Revolve tool. The datum that you just created will be used as the sketch plane for the Revolve. 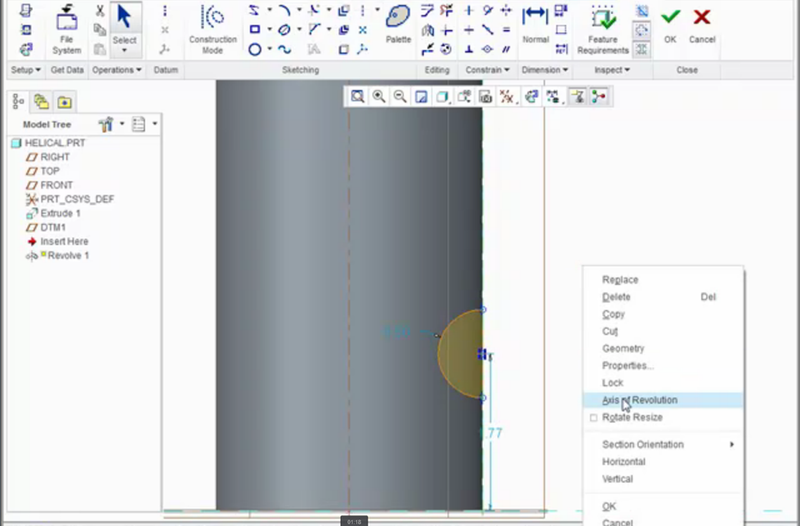 In Sketcher, select References and capture the silhouette edge of the cylinder as a reference. Next, using standard Sketcher workflows, create the half circle for the spherical cut at the edge of the cylinder. Create a Geometry Centerline along the edge of the cylinder for the half circle to revolve around. Designate this centerline as the Axis of Revolution. Complete the Sketch, and select the option to Remove Material from the Revolve dashboard to make a cut. After creating the first cut, you will have the dimensioning scheme needed to create the helical pattern. We will define the pattern to increment two dimensions in the same direction. 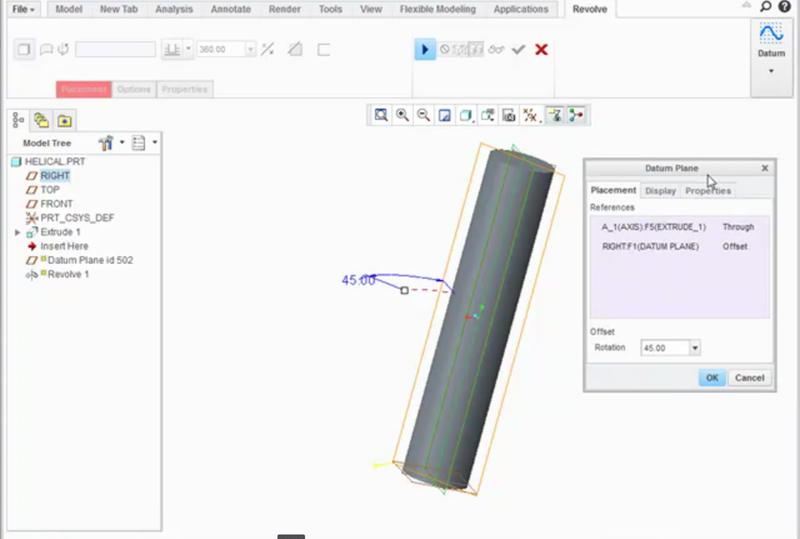 Select the Pattern tool for the revolve feature and open the Dimensions tab. Select the 45 degree dimension to rotate the feature around the shaft, and set the increment to 45 degrees. While holding the Control key, select the linear dimension from the end of the shaft to pattern the cut along the length of the shaft. Set the increment appropriately for the shaft size. Finally, enter the number of instances you want to have in the pattern and complete the Pattern feature. 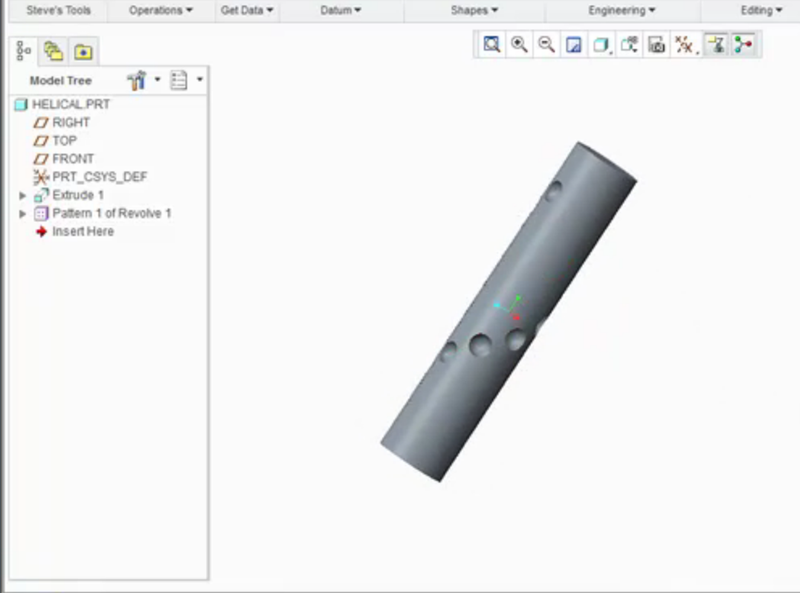 PTC Creo Parametric gives you additional capabilities to define patterns. For example, the tutorial linked below demonstrates how to increase the number of revolved cuts that are patterned along the shaft by adding a second direction to the pattern. In conclusion, creating a helical pattern on the side of a cylinder is simply a matter of setting up the sketch properly to get the correct dimensioning scheme and patterning two dimensions in the same direction. Check out our video tutorial on the PTC University Learning Exchange (“Creating a Helical Pattern”) to see this advice in action. We’d also love to hear your suggestions for creating patterns in PTC Creo Parametric.